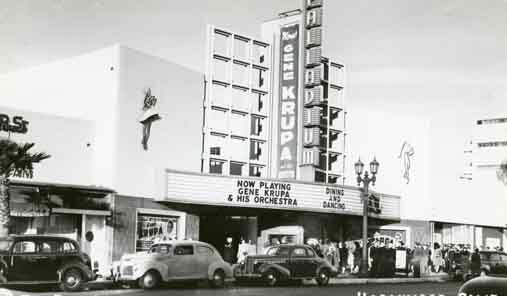 Exactly 4 months after luscious Lana Turner, with a silver shovel, started in the groundbreaking ceremony, the doors of the now world famous Hollywood Palladium swung open to begin its colorful career of catering to the dining and dancing pleasures of film stars, world noted celebrities and a flow of tourists from all over the world. On October 15, nearly sixty eight years to the day that the Hollywood Palladium ushered Los Angeles into the swing era with a grand opening performance of the Tommy Dorsey Orchestra featuring a young Frank Sinatra, rap mogul Jay-Z took the stage with his own 12-piece Roc Boys ensemble. The Hollywood Palladium is located on Sunset Blvd., just east of Argyle Ave.
Los Angeles Times publisher, Norman Chandler funded the construction of the art deco Hollywood Palladium at a cost of $1.6 million in 1940. It was built where part of the original Paramount Studio lot once stood and is located between Argyle and El Centro avenues.